Find a quick knit that is useful and, preferably, beautiful. Ignore all those around you until you finish. It's just a gorgeous (and fast!) hat. I love it but it looks so much better on N so we're sharing. I needed to jump start the mojo, so I didn't get the beads. I think it looks good with or without them. I have more mojo enhancing steps to come, but for now we at XRK would like to wish everyone a happy and safe Thanksgiving. And don't forget to visit Carol's great Thanksgiving Quiz. Ah, family. There's a few personal rules I've got for my knitting, rules I've learned from the past 7 years of knitting. All knitters have them; I'm sure you've got a few of your own. They save us knitters from making the same mistakes again and again, or from making garments that are almost great, but not quite. I always add an inch or so of length to sweaters, for example. Heel flaps, not short-row heels, please. Launder swatches. Finish carefully and fastidiously. Now I have a new one. No funnel neck sweaters. I've made multiple sweaters that call for funnel necks, and I always end up modifying it. I always knit the funnel, and when I try it on, I hate it. I have a short neck, and funnel necks look like I'm wearing the sweater backwards or something. When I knit the Refined Raglan, I settled on a crew neck. When Mr S tried on his Dylan Goes Electric, he hated the funnel too, so I changed it to a roll neck. Imagine the time I'll save when next I encounter a pattern with a funnel neck. I can dispense with the step of knitting the funnel neck, ripping it, and then experimenting with other necklines. It took the Counterpane Pullover for me to finally get it. 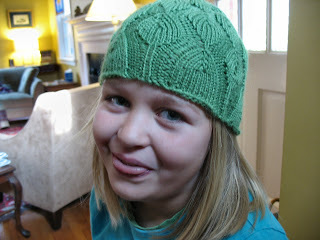 Once again I knit the funnel, tried it on, hated it, and promptly ripped it out. Because of the unique construction of this sweater, I was unable to do anything much more than the small cowl-ish, mock turtleneck-ish neckline without a lot of ripping. If I planned a modified neckline at the beginning, I'd have a lot more options to choose from: a scoop, a more pronounced cowl, a split neck. It's an extremely warm and cozy winter sweater, and while I'll admit it isn't the sexiest garment I've ever made, I did learn something valuable. 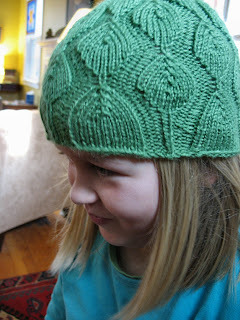 And really, this was a process-knit from the start. 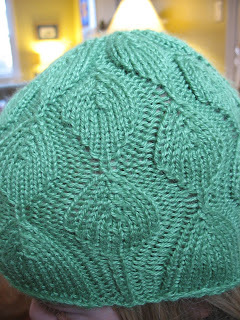 It was great fun to make; it knit up over the course of a week -- it only took longer to finish because of my neckline issues and becasue I had to search out another skein of yarn from a fellow Raveler. If you want more details about my mods, check Ravelry. In January, I christened this "The Year of Relaxing" with a sub-title of "Mistakes Will Be Made." In contrast to past resolutions (be more compassionate, get better about the laundry, floss more often), I have more than met the challenge this year. I won't go into details, but rest assured, when I relaxed* about things, mistakes were made. And we have all survived. It's been a great lesson for me. I dropped many of my volunteer activities at the girls' school and instead took up more mentoring responsibilities in our struggling public schools. (And yes, mentoring a needy child is far more relaxing and rewarding than chairing a school-wide fundraiser or being secretary of the Parents' Association.) I was also lucky enough to spend some time volunteering for President-Elect Obama and participating in true community empowerment. At the end of the summer, while in the midst of a professional identity crisis (should I go back to work after almost nine years? what should I do? am I good at anything other than nagging anymore? ), I decided to spend Friday mornings kayaking on the river -- Goof Off Fridays. The time on the river, arrested only recently due to the cold, was deeply restorative and took the edge off all the questions that continue to swirl around me. And what about the knitting? You would think that knitting would fit right into a year of relaxation. But lately my knitting has been unfocused. Picking up a project, growing bored with it, and then setting it down -- maybe forever. This is unusual for me. I almost never have UFOs hanging around the house. 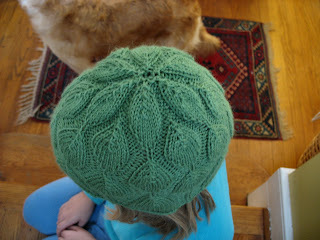 But except for some baby hats, not much has been finished in the past month. Nothing to blog about. Nothing interesting on the needles. No sweaters. No scarves. No challenging colorwork. No stunning shawls. No cute mittens. Just a few baby hats. I've had inspirational political experiences. Inspirational mornings on the river. Inspirational community involvement. But no inspirational knitting. It's time for me to be pro-active about this. I refuse to let my knitting mojo be a casualty of The Year of Relaxing. I have a plan to try to get it back. Stay tuned. *By "relaxing" I mean "lowering my standards." It translates into not vacuuming the house everyday, not obsessing about the garden, buying prepared foods now and then ... basically cutting myself some slack.